I sit here in Dubai, it's supposed to be winter. We had about 30C outside temperature, hot enough to just scream for ice cream. We also had a "lovely" dust storm whose dust comes into the house anyway, no matter how much you keep windows and doors closed and shut. That is dust for about three days, as, even after the storm is over, the dust needs another 2 days to settle (onto you furniture and wherever else you don't want it). I shouldn't really post a recipe of a warming and hearty root vegetable soup now, perfect for cold and rainy/snowy winter days. Perhaps I do it because we went to the Dubai indoor ski slope for the first time ever (it's been around for 3-4years). Should I mention that I didn't even get in, because my 2-year daughter wasn't allowed to go there? We prebooked and prepaid the overpriced tickets online, without knowing that under 3 year olds have no access. At least, father and son had sort of fun, but wouldn't go there again. Maybe I post this, because hearty vegetable soups are comfort foods for me. This is all I need tonight after a more or less disastrous afternoon, trying to entertain our children and impress our guests from overseas. This soup is easy to throw together as the main cooking is done while you don't have to stand by the oven. I like the different layers of veggies in there: the tomato based sauce, thickened by dissolved red lentils (so they should after an hour of cooking), the chunky root vegetables and, of course, the chewy barley. Another good thing about those kind of soups is, that you can throw in or omit whatever you like. 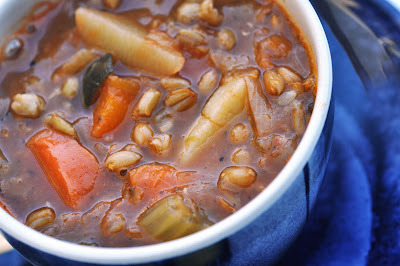 I am sure, this soup will also work without grains, or with different grains. In fact, I didn't have barley at hand the other day and used spelt. Vegetable-wise, throw in whatever you like, or needs to be cleaned out from the fridge. I'd say that anything from cabbage to green beans would go well in this soup. Try your own version, it's so versatile. Make a big pot, and have it over several days. It gets better and better! Heat the olive oil in a big heavy-bottomed pot over medium heat. Saute chopped onion, celery and carrots for a few minutes. Add marjoram, salt, pepper and tomato paste and saute for another few minutes. Now stir in the barley and the lentils, potatoes, zucchini and turnips. Add enough water to cover the vegetables and barley mixture by 2 inches. Cover partially and simmer for about an hour.